I was recently asked a good question by one of the team members. They wanted to know if it would be possible to control the insertion of values in a table to match a given set of business rules via check constraints. What attracted my attention and prompted me to spend some time with them was the fact that they knew CHECK constraints were the answer, but were unaware about how to use CHECK constraints in this scenario. The solution that I provided was to use regular expressions in the CHECK constraint definition. Here’s a small example that will guide the reader on using regular expressions in CHECK constraints. Assume that the fictional AdventureWorks BiCycle Company has a business rule that all invoices being processed must begin with the letters AWC followed by a 5-digit number beginning at 10000, making the pattern (AWCxyyyy, where x = some integer greater than or equal to 1, y = some integer). As can be seen from the messages tab, we notice that only 1 record was added to the table – the others failed because they did not meet the Invoice Number requirements. The INSERT statement conflicted with the CHECK constraint “chk_InvoiceNumber”. The conflict occurred in database “tempdb”, table “dbo.#InvoicesProcessed__________________________________________________________________________________________________000000000004”, column ‘InvoiceNumber’. Let us validate the Inserts by SELECTing data from the table. Regular Expressions are extremely powerful and CHECK constraints is just one of the many Microsoft SQL Server provides areas where they can be leveraged to enforced the rules required by the business. 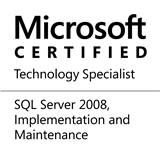 This entry was posted in #SQLServer, Blog, Imported from BeyondRelational and tagged #SQLServer on August 12, 2013 by nakulvachhrajani.